Thank you McCormick for sponsoring this post. Visit your local Walmart to pick up McCormick Good Morning Breakfast for your family! Add a delicious new treat to your breakfast! 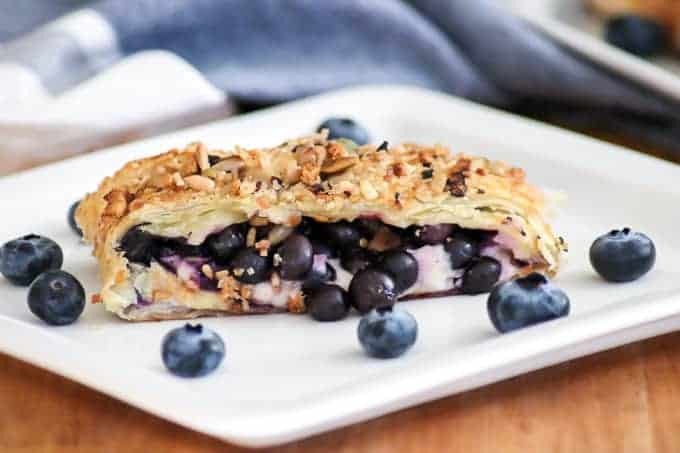 This Blueberry Ginger Cheese Danish with fresh blueberries, crystallized ginger, and sweetened cream cheese wrapped in a puff pastry will be the perfect accompaniment to your morning coffee. 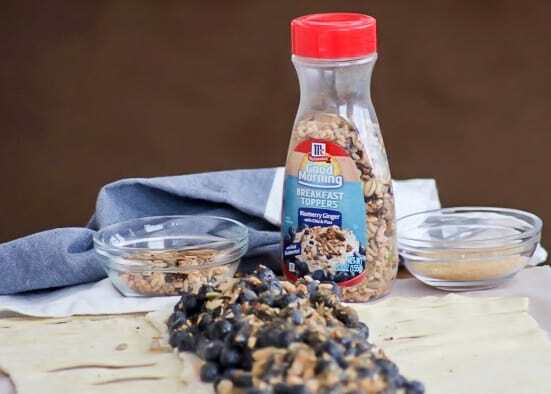 Topped with McCormick® Good Morning Blueberry Ginger Breakfast Toppers, you’ll enjoy the additional flavor and goodness it provides! To me, breakfast just isn’t breakfast without some fresh fruit to go along with it. Typically, I like to eat a bowl of yogurt with some granola, chia seeds, strawberries and blueberries mixed in. I find that this choice over a typical bowl of cereal and milk will make me feel better and give me a better start to my day. On the other hand, when the weekend rolls around, I like to indulge a little bit. A few pancakes, French toast, a cinnamon roll or a slice of this Blueberry Ginger Cheese Danish and I’m immediately in my happy place. Recently, I’ve enjoyed making a Danish or breakfast braid with pastry dough. They’re pretty easy and have quickly become a morning favorite. When I asked Kurt and Cameron to taste this Danish for me, they both absolutely loved it! Kurt said it was one of the best breakfast recipes I’ve made to date and Cameron ate three-quarters of it by himself in like 10 minutes flat. That kid is unbelievable! So, you can definitely bet I’ll be making this at least once a month. A Danish just isn’t a Danish to me without some sweetened cream cheese. And, if you’ve never combined some blueberries with a little bit of crystallized ginger, you’re missing out. Trust me. It’s just such a fun and tasty flavor combination. – Sprinkle on yogurt, cottage cheese or fruit. – Stir into hot cereal for a crunchy twist. – Shake on buttered bagels or toast. I’m super excited to try the Pineapple Toasted Coconut in my yogurt tomorrow and will be serving it with our next Breakfast Parfait Bar. It will also be a delicious addition to this Pineapple Bread that I love so much. The Cocoa Banana will be delicious in some overnight oatmeal or even as a topping for my Chocolate Banana Muffins. And you can bet that the Southwest Chipotle is going to be sprinkled on these Loaded Huevos Rancheros! Breakfast is my favorite meal of the day and always has been. Breakfast, brunch, breakfast for dinner, I’m ALL over it! I’ve never thought about having quesadillas for breakfast, but this Southwestern Breakfast Quesadilla Recipe with Eggs, Black Beans & Salsa is something I’ll definitely have to try! I love a great jam and the thought of this Blueberry Ginger Jam on some scones or an English muffin is making me drool. A Pineapple Coconut Sweet Roll with a cup of coffee sounds like a great idea right about now, too. 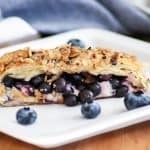 This Blueberry Ginger Cheese Danish is quickly going to become your new favorite breakfast treat! 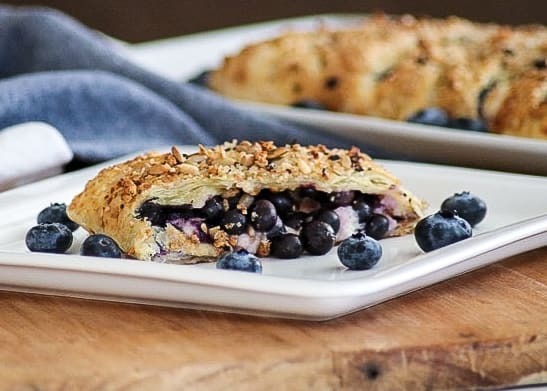 A slice of Puff Pastry with sweetened cream and blueberry ginger filling sprinkled with McCormick® Good Morning Blueberry Ginger Breakfast Toppers is hard to resist. In a large bowl, combine the blueberries, cornstarch, lemon juice, lemon zest, water, crystallized ginger, and sugar and mix until well combined. In a mixing bowl, beat the cream cheese until whipped. Add the vanilla and confectioners' sugar and beat until well blended. Roll out the pastry dough on a piece of parchment into a 12' X 14' rectangle. With a knife or pizza cutter, cut strips into the sides of the dough at least 3 inches long into the middle and 1-inch in width. Spread the cream cheese evenly down the center of the braid. Spoon the blueberry filling over the cream cheese. 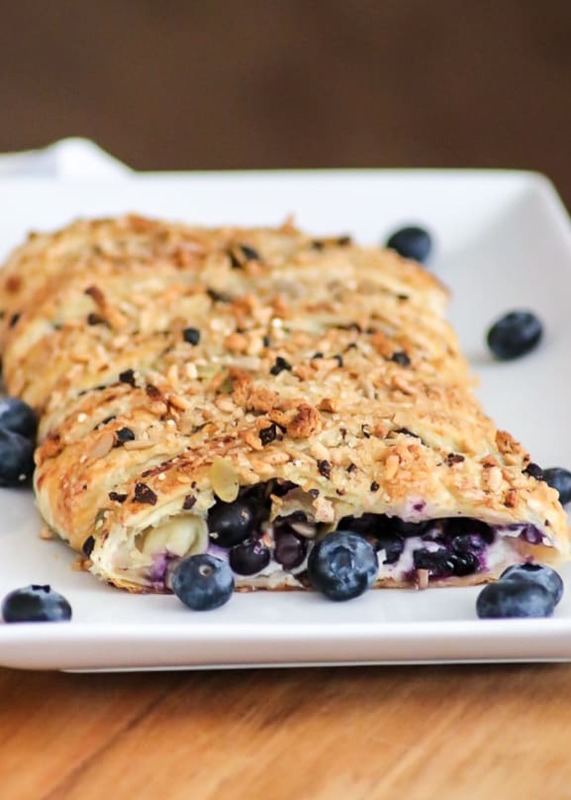 Sprinkle 2 tablespoons of the McCormick® Good Morning Blueberry Ginger Breakfast Topper over the blueberry filling. Beginning at one end, fold two opposite slices of dough in the form of a crisscross over each other and continue to the opposite end. In a small bowl, beat egg and mix with water. Using a pastry brush, coat the danish with the egg wash.
Sprinkle the remaining two tablespoons of the McCormick® Good Morning Blueberry Ginger Breakfast Topper and the raw sugar along the top of the dough. Place the danish and parchment on a baking sheet and put into the oven to bake for 20 minutes.